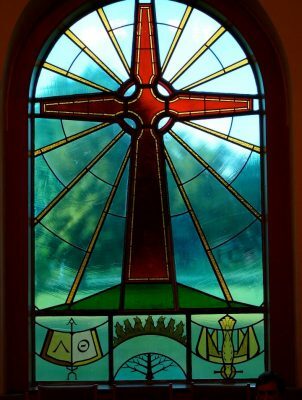 Worship is at the heart of our congregational life at Beaumont. By lifting our voices in prayer and praise, joining in confession and being assured of God’s unending forgiveness, affirming our faith and hearing God’s Word proclaimed, we become truly the body of Christ that we understand as church. Please read below for more detailed information. The Worship and Music Ministry has responsibility to plan and coordinate with the pastor(s) and Director of Music the corporate worship life of the congregation. 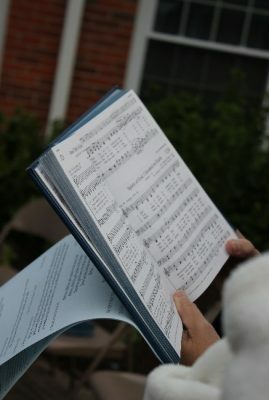 plan for the annual corporate worship of the congregation guided by the “Directory for Worship” in the Book of Order, Presbyterian Church (U. S. A.). develop and maintain policies concerning liturgical appointments in the sanctuary, i. e. flowers, paraments, banners, etc. work with the session to develop and maintain policies related to weddings, funerals and other uses of the sanctuary, and make the policies available to the congregation. lead the congregation to a deepening understanding of and commitment to the worship of God in our Reformed tradition. We worship each Sunday, rain or shine! Our regular worship service is at 11 AM — in the summer, we move worship to 10 AM. Our hour-long service is often based on the Revised Common Lectionary, the group of scripture readings (Old Testament, Psalms, New Testament and Epistles), which typically sets the tone for our music and preaching. 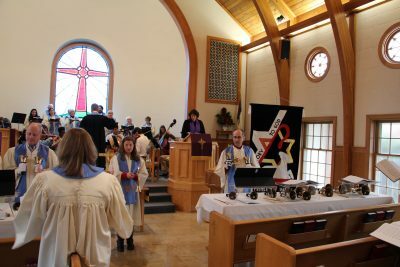 Worship is led and enhanced by members of our congregation who serve as liturgists, ushers, acolytes, soundboard attendants, and flower arrangers; our musicians under direction of Dr. Wayne Gebb; and our clergy staff, Rev. Dr. Kathy Riley and Rev. Cindy Harris. For Presbyterians, prayer is at the heart of worship. In prayer, through the Holy Spirit, we seek after and are found by God, revealed to us through Jesus Christ. We listen and wait upon God, call God by name and offer ourselves or God’s work in the world. We respond to God in adoration, praise and thanksgiving. In confession we acknowledge the ways in which we fall short of God’s hope for humanity. And in our intercessions we pray for our loved ones, our friends, and for all of God’s world. Our church confesses scripture to be the written testament to God’s Word. The reading and proclamation of scripture is central to our worship, as we prayerfully glean insight, comfort and inspiration from the book of our faith, the Bible. Our two sacraments are holy to us Presbyterians — baptism and communion. Baptism is a sign and seal of our incorporation into Christ, the symbol of our inclusion in God’s covenant. Baptism is typically administered to the infant children presented by their parents. However, baptism can be administered to those of any age who have not previously received it and who wish to make a proclamation of faith. We welcome anyone who wishes to be baptized into the priesthood of all believer. Celebration of the Eucharist — the Lord’s Supper — is a time of joy in our congregation. We join in this celebration typically on the first Sunday of each month, as well as on special days in our church calendar such as Ash Wednesday, Maundy Thursday and Christmas Eve. Most of the time we serve by intinction, in which congregants come forward to dip the bread in the cup. At other times, we serve communion by passing the elements. All who come to the table are offered the bread and cup, regardless of their age or understanding. Our service of worship is traditional, but not overly formal. We regard laughter as a welcome sign of the joy God hopes for us, we regard silence as a necessary element in listening for God’s whisper. Our music program at Beaumont is active, creative, dynamic and an incredible blessing to our congregation. Under the direction of Dr. Wayne Gebb and with the accompaniment of Larry Sharp, our Chancel Choir is flourishing, creating a means of lifting our hearts to God by way of ear and voice. Our music style is traditional with a flair for using other elements. Our goal is to enhance worship with worthy musical offerings, making an important contribution to the life of the church. Holy Kidz, our children’s choir led by Gywnn Siemen, offers our young people an opportunity to make a joyful noise and engages our congregation in the joy of worship led by our children. The Faith Ringers, our bell choir led by Lynn Ervin, plays throughout the school year. On special occasions, smaller bell ensembles such as quartets, will also play. We also periodically include string and brass ensembles as well as solo or duet instrumentalists. We’ve even been known to throw in a touch of Bluegrass from time to time. At Beaumont, we regard music as a key component of our worship experience. Our choirs are open — there is room for you!